Above is a short video showing me performing various aspects of bookbinding. This was shot for a consumer electronics manufacturer in 2013. For information on how to get a treatment estimate, please contact Jeff via phone or email. 1988 B.A. in English Literature, Goshen College, Goshen, In. 1996-Present. Independent Book Conservator, NYC. Provides conservation treatment services for libraries, museums, individuals, dealers and private collectors. Invents, manufactures and sells specialized tools and machines for book conservation, including The Peachey Board Slotting Machine, which is used in conservation labs worldwide. Consults, publishes, teaches and lectures on bookbinding, book history, and book conservation nationally and internationally. 1992-1996 Columbia University Libraries, NYC. Special Collections Technician. Performed single-item book treatments, environmental and condition surveys, written and photographic documentation, under the direction of the Head of Conservation. Materials ranged from 13th century manuscript fragments to modern first editions. Maintained statistics, evaluated and ordered supplies. Prepared materials for exhibition and travel. Matted and framed artwork. 1990-1992 Columbia University Libraries, NYC. General Collections Technician, NEH Grant. Treated circulating collections, and medium-rare material from 16o0-present, including limp and stiff-board vellum, paper-case, leather and cloth bindings. 1990 Teachers College, NYC. Part time conservation technician. Fabricated protective enclosures. 1989-1990 The Gotham Book Mart and Gallery, NYC. Book clerk. 1988-1989 Toga Bike Shop, NYC. Bicycle mechanic. 2016 (coauthor Ervin Beck) “Ausbund 1564: The History and Conservation of an Anabaptist Icon.” Pennsylvania Mennonite Heritage (October 2016): 128-135. 2013 “Beating, Rolling and Pressing: The Compression of Signatures in Bookbinding Prior to Sewing” In Suave Mechanicals: Essays in the History of Bookbinding, Volume 1. (Ann Arbor: The Legacy Press, 2013): 316-381. 2012 “Special Considerations for Private Book Conservation Laboratories.” In The Planning and Construction of Book and Paper Conservation Laboratories. (Chicago: Association for Library Collections & Technical Services a Division of the American Library Association, 2012): 157-175. 2011 Book review. “From the Hand to the Machine by Cathleen Baker.” The Bonefolder, 7, no. 1 (2011): 77-79. <http://www.philobiblon.com/bonefolder/vol7contents.htm&gt; Reprinted in Bull & Branch, 31, no. 2 (2011): 77-79. 2011 (coauthor Alexis Hagadorn) “The Use of Parchment to Reinforce Split Wooden Bookboards, With Preliminary Observations Into The Effects of RH Cycling on These Repairs.” Journal of the Institute of Conservation, 33, Issue 1 (March 2010): 41-63. 2009 “Contextualizing ‘The Joiner and Cabinet Maker’” in The Joiner and Cabinet Maker. (Fort Mitchell, KY: Lost Arts Press, 2009): 356-366. 2008 “Review of Panel Discussion” Guild of Book Workers Newsletter, no. 177 (2008): 10. 2004 “A Few More Thoughts on Spokeshave Modification ” Guild of Book Workers Newsletter, no. 155 (2004): 13. 2001 “Golden Artist Colors” Guild of Book Workers NYC Newsletter, no. 21 (2001): 3. 1998 “W.O. Hickok Mfg. Co.”Guild of Book Workers Newsletter, no. 121 (1998): 5. 1997 “Iris Nevins Marbling Workshop” Guild of Book Workers NYC Newsletter, no. 10 (1997): 2. 1996 “Review of Beyond the Deckle Edge” Koob Stra, XVI, no. 15 (Fall 1996): 3. 1995 “Hand Papermaking in Northern Vietnam” Hand Papermaking, 10, no. 1(1995): 13-17. 1994 “An Undocumented Sewing Structure” Paper Conservation News, no. 69. 2017 “1564 Ausbund, Newly Conserved, On View at Spring MAH Meeting” MAH News and Notes, Michiana Anabaptist Historians, 26, no. 1, (Spring 2017): 2. 2016 “In the Midst of Joyous Toolmaking with Jeff Peachey” Guild of Book Workers Rocky Mountain Chapter, Thursday, June 20, 2016. <http://rmcgbw.blogspot.com&gt; Reprinted in the Guild of Book Workers Newsletter, no. 227 (August 2016): 16. 2016 Brock, David. “A Review of Suave Mechanicals:Essays in the History of Bookbinding” The Book Club of California Quarterly News-Letter, LXXXI, no. 1 (Winter 2016): 18-21. 2015 Smith, Daniel. “Having an Edge: A One Day Workshop with Jeff Peachey.” Guild of Book Workers Newsletter no. 219 (April 2015): 12-15. 2011 Kremser, Valeria. “The Page Illuminates: Book Highlights from the Internet” DVC Pressing Matter: The Delaware Valley Chapter of GBW, (January 2011): 2. 2011 “Interview with Jeff Peachey” Susan Mills, Bookbinding Now, podcast. 2010 Takacs, Chris. “Jeffrey Peachey: Late Eighteenth Century French Binding Structures”, Guild of Book Workers Newsletter no. 193 (December 2010): 15. 2010 Green, Arthur and Maria Kalligerou. “Workshop review. Making and Sharpening Knives: A Rational Approach.” ICON News (November 2010): 26-27. 2009 Campbell, Brenna. “Workshop Review Late 18th Century French Bookbinding Workshop.” The Guild of Book Workers Newsletter, no. 186 (October 2009): 16-17. 2007 “Utraquist Gradual Conservation” Friends of the St. Marks Library, Winter 2007. Review, University of Oregon Libraries, LSA News, LSA no. 79 Feb 2007). 2007 Laubacher, Kevin. “Knife making with Jeff Peachey.” Guild of Book Workers Newsletter, no. 171 (April 2007): 5-6. 2007 Barclay, Algeria. “Jeff Peachey: On the Fine Art of Knife Sharpening.” Guild of Book Workers North East Chapter Newsletter, 26, no.3 (2007): 3-5. 2004 “fyi” Vitals, September, no. 1, 2004. 2003 “Who Can Rebind My Rare Book?” New York Magazine, Sean Kennedy, Nov. 3, 2003. 2014-2020 Columbia University, NYC. Treatment of rare volumes from the Health Science Library, primarily oversized medical atlases. 2006-2007 Union Theological Seminary, NYC. 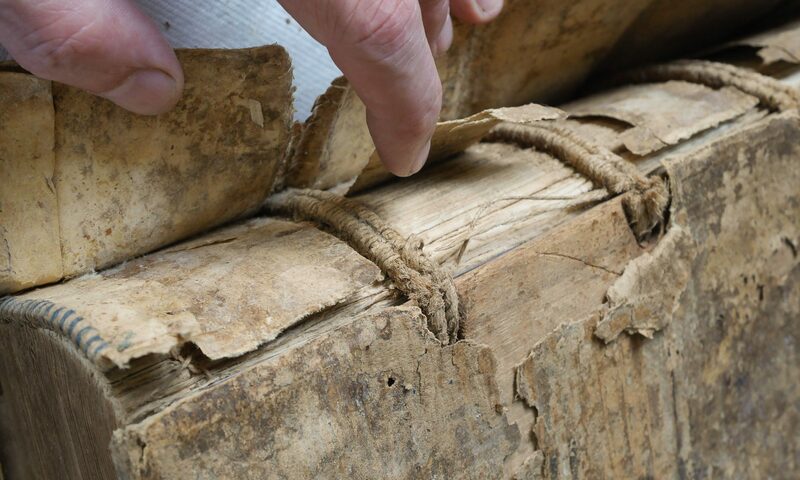 Treatment of late 15th and early 16th century wooden board bindings. 2000-2001 The New York Academy of Medicine, NYC. Treatment of 19th century colored Medical Atlases with moveable flaps. 1999-2000 Union Theological Seminary, NYC. Condition survey, supervised and trained staff, performed treatments and disaster recovery. 1996-1997 American Museum of Natural History, NYC. Rare Book Survey and Stabilization Project. I second Daniel’s commendation of the “Conservation of JAIC” article. Genius. Simply genius. Thank you for making my day. Really interesting pages – Thanks! Just started to take an interest in book-binding, with a view to working at book conservation. Lots to read about and think about, too. Badass CV. You’re the man, Jeff. Very impressive creds and pubs. Chapeau to your amazing work!! Super cool and informative blog – thank you for sharing.